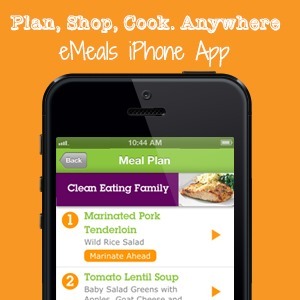 eMeals iPhone App is Finally Here! Yesterday was a perfect example of why my new favorite thing about eMeals is the iPhone app. I had been running around helping with a fundraiser, all while trying to get personal errands done too. Suddenly, I realized, this would be my only opportunity to go grocery shopping for the next few days. Deciding at the last-minute to do my shopping wasn’t a problem now that my grocery list is always on my phone. I was a little behind on our meals for this week, and knew we wouldn’t need all seven. Usually, I have to sit and figure out which ingredient we don’t need, but with the new app I can easily “skip a meal,” and it takes the items off my shopping list. I didn’t have to worry about being to tired to figure it out, it was done for me. 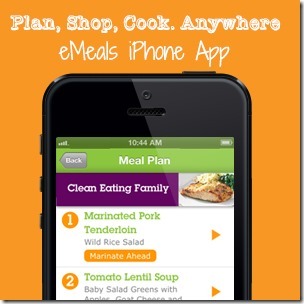 I was able to get in and out of the grocery store quickly, run home, pull the recipes up using the app and start cooking. While testing out the app, I found that it also marks the recipes that need special preparation, for example marinating. I thought that was very helpful, because I have been guilty of going to cook something, only to find it was supposed to be marinating for 24 hrs. I’m so happy eMeals has added this, and was very pleased with my experience using this app. I wouldn’t have been able to make this grocery trip today with out it, so this feature has definitely proven its worth to me already. Yes, it is convenient. I think our iPhones are one if the only convenience items we have held on to, mainly for sanity’s sake. I’ve been so excited for them to come out with an app!